Did work in the nuclear weapons industry make you ill? IF YOU HAVE been employed in the nuclear weapons industry and have been diagnosed with cancer, chronic beryllium disease, beryllium sensitivity or silicosis — and your illness was caused by exposure to radiation, beryllium or silica while working in the industry — you may be eligible for compensation or medical benefits under the Energy Employees Occupational Illness Compensation Program Act (EEOICPA). The EEOICPA is administered by the Department of Labor’s Division of Energy Employees Occupational Illness Compensation (DEEOIC). 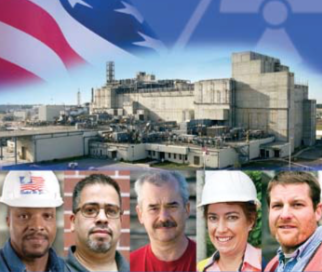 To be eligible for compensation or medical benefits, you must be a current or former employee at a covered DOE facility, an Atomic Weapons Employer facility, or a beryllium vendor facility during a specified time period. The EEOICPA has two parts. Under Part B, current or former workers employed at designated facilities may receive a lump sum compensation payment of $150,000 and medical expenses for their covered condition. Under Part E, DOE contractor and subcontractor employees exposed to a toxic substance at a covered DOE facility during a covered time period, where such exposure was a significant factor in causing, contributing to, or aggravating their claimed illness, may receive payment for their related medical expenses and may also be eligible for impairment and/or wage loss compensation. Eligible survivors may receive a lump sum payment of $125,000 and may also receive additional compensation if the worker experienced wage loss due to the accepted condition. For more information or to schedule an appointment for claim-filing assistance, contact one of the 11 nationwide resource centers listed on this page. Another great place to start is the Building Trades National Medical Screening Program or BTMed. The BTMed program offers guidance and a two-step process to determine if you are a likely candidate for compensation. This includes a work history interview (in person or by phone or a secure website) to determine possible exposures and is followed by free medical screening at a nearby clinic. More information is available at 1-800-866-9663 or at www.btmed.org. CONTACT ONE OF THE DOE RESOURCE CENTERS BELOW OR VISIT WWW.BTMED.ORG.